Dynamic & Elegant “KOREA” was created for the purpose of cultural exchange of informing the public about the art and culture of Korea. 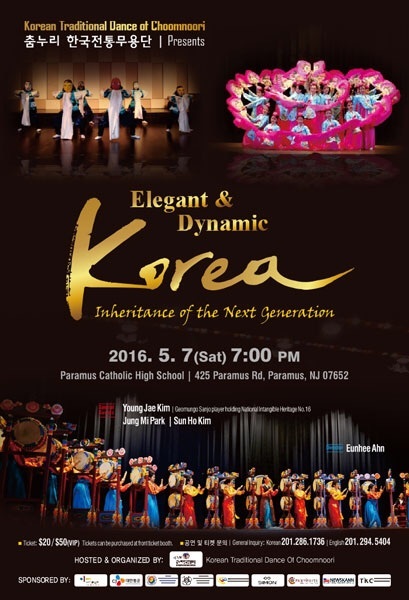 The National Treasures of Korea and Chinese Lion dancers will be featured as special guests for the performance. This will be unique and valuable educational experience for all children and adults. For more information, please contact Korean Traditional Dance of Choomnoori at 201-286-1736 (Korean) or 201-294-5405/ 551-200-2760 (English). Tickets can be purchased at front ticket booth.